This expansive, designer house set on a large flat section on the beachfront at Langs beach is simply stunning. With breath-taking sea views, great entertaining spaces inside and out and a designer kitchen it is an entertainer's delight. There is a separate downstairs lounge for the kids to chillout, watch TV or play pool and with plenty of space for the cars and boats and a large flat lawn for summer games what more could you want. After a day at the beach stroll back to the house and soak in the views from one of the entertaining decks with a cold drink in hand. On cooler nights bask in the warmth of the stunning gas fireplace. This is truly the perfect place to relax and enjoy the magic of Langs beach under two hours from Auckland. Grab you friends and family or organise your corporate get together at this luxury beach-side retreat. 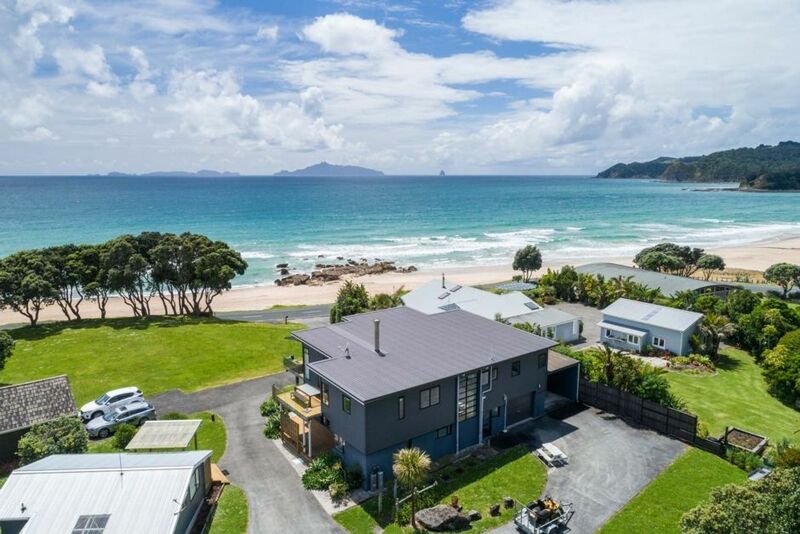 Langs beach is the perfect summer holiday destination or coastal retreat. With its beautiful swimming and surf beaches and abundant marine life, Langs is a popular spot for sailing, fishing, surfing, diving and summer family fun. Enjoy the vibrant art and cafe scenes and local markets of Mangawhai and Waipu less than 15 minutes away. Soak up the natural beauty of this slice of coastal paradise, beachcombing, bush walking or just relax. Ideal property for us with the adult children and our 3 grandsons. Well equipped and heaps of space. Great location across the road from the beach. Thanks for your feedback, it is much appreciated and we will discuss your comment on the BBQ with the owner. Fantastic property right across the road from the beach. Fantastic property right across the road from the beach. Perfect for us as we were 6 adults and 6 children so lots of room for everyone. Would love to go back again. Loved the beach house, it had great space for our extended family to stay together and the views were awesome, will definitely be back! Wonderful beach front property. Well fitted out. Could do with one more bathroom. Thanks for your feedback. Regarding the bathrooms, it does have two bathrooms, one on each level and one has a separate toilet which is reasonably in proportion to the occupancy of the house.